Hill and Wang, 9780809089178, 304pp. What is art? Why does it matter to us? What does it tell us about ourselves? Normally, we look to works of art in order to answer these fundamental questions. But what if the objects themselves are not what matter? 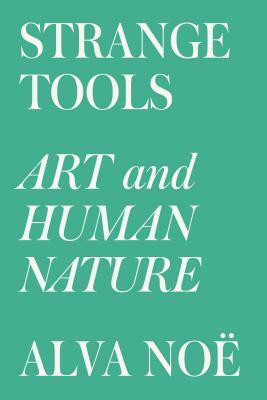 In Strange Tools: Art and Human Nature, the philosopher and cognitive scientist Alva Noë argues that our obsession with works of art has gotten in the way of understanding how art works on us. For Noë, art isn’t a phenomenon in need of an explanation but a mode of research, a method of investigating what makes us human—a strange tool. Art isn’t just something to look at or listen to—it is a challenge, a dare to try to make sense of what it is all about. Art aims not for satisfaction but for confrontation, intervention, and subversion. Through diverse and provocative examples from the history of art-making, Noë reveals the transformative power of artistic production. By staging a dance, choreographers cast light on the way bodily movement organizes us. Painting goes beyond depiction and representation to call into question the role of pictures in our lives. Accordingly, we cannot reduce art to some natural aesthetic sense or trigger; recent efforts to frame questions of art in terms of neurobiology and evolutionary theory alone are doomed to fail. By engaging with art, we are able to study ourselves in profoundly novel ways. In fact, art and philosophy have much more in common than you might think. Reframing the conversation around artists and their craft, Strange Tools is a daring and stimulating intervention in contemporary thought. Alva Noë is a professor of philosophy at the University of California, Berkeley, where he is also a member of the Institute for Cognitive and Brain Science. He is the author of the books Out of Our Heads and Action in Perception.